The Bergen Counseling Center is excited to announce the first workshop in our free 2018 workshop series. Our resident mindfulness expert Dr. Carolyn Versical will be leading a free introduction to mindfulness workshop at our Ravenswood, Chicago office location on Saturday April 7th, 2018 from 10:00AM-11:00AM. The free mindfulness workshop is open to both our current clients and the general public. No prior knowledge or experience practicing mindfulness is necessary to attend the free mindfulness workshop. Dr. Versical will help attendees understand the basics of mindfulness and also provide practical ways to incorporate mindfulness into daily life. The practice of mindfulness has been gaining a lot of popularity recently and for good reason. Consistent practice of mindfulness has been shown to help individuals decrease anxiety, depression, improve a general sense of well-being, and even assist people develop a healthier relationship with food and eating. A free mindfulness workshop that can help you increase your sense of well-being, decrease anxiety and depression, and help you gain a healthier perspective during daily life, so what’s the catch? Space is limited! Although the mindfulness workshop is completely free, we kindly ask that all attendees register and reserve their spot for the workshop on April 7th at 10AM. Please fill out the reservation form below to reserve your space today. Would You Like to Be Contacted Before the Workshop? 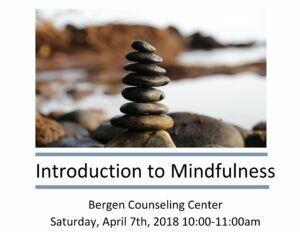 In addition to a courtesy reminder email, either Dr. Versical or another representative from Bergen Counseling Center will contact you to confirm your registration and answer any questions you may have about the mindfulness workshop. Would You Like to Be Contacted by the Bergen Counseling Center Regarding Individual or Couples Counseling? A representative from the Bergen Counseling Center will reach out to you to provide a free 15 minute consultation regarding the counseling process and to help schedule an initial appointment. If you are in crisis, please do not select YES. Consultations are not intended for emergencies. Please call 911 or go to your nearest emergency room. Your answers help us make our workshops useful, relevant, and interesting to attendees. Would You Like to Receive the Bergen Counseling Center Newsletter? We will NEVER sell your contact information or contact you for solicitation purposes.